Add a candle to this five-pointed star to fill the night with celestial light. This Artistic hanging lantern feature ornate panels of clearest glass set into a wrought-iron frame. Patterned glass panels glow richly when lit from within, creating a captivating crimson glow. Traditionally formed from glass and iron for a timeless decoration that adds sparkle to any decor. Add charm to your home décor Or Living Room with the CraftVatika Lantern . This set will render a colourful appeal to your room and will look pleasing to the eye. 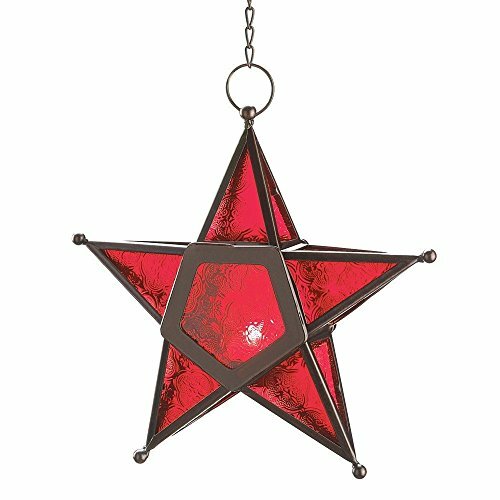 Red Star Shape Hanging Lantern Holds One Candle (not included) - Excellent indoor or outdoor accent item. Perfect decorative item for home & living room special occasion festive seasons.